Well it sort of feels like Fall in Illinois. This week the 80 degree temps finally dipped a bit and allowed for boots and a light cardigan. With leaves changing comes pumpkin spice lattes, chunky sweaters, boots, apple cider, pumpkin-patching, plaid...you get the point. But maybe best of all, my most favorite weekend to kick off all things Fall: Spoon River Drive flea market weekend. Every year this event is on our calendar. 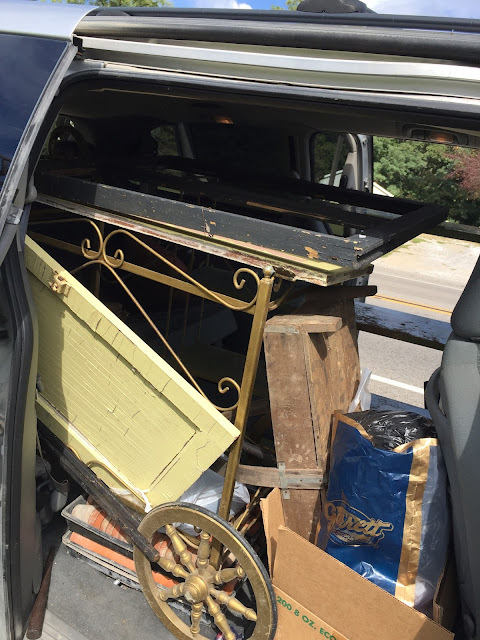 My mom, sister and I load up in my dad's work van and travel the Spoon River Route popping in and out of vendors booths, antique shops, and flea markets. We typically fill every inch of the vehicle with treasures. We usually follow about the same route every year, sometimes changing it up--sometimes not. Hannah City: Go to Hannah City for the junk vendors. This town is typically filled with vendors on the side of the road, in parking lots and front yards. It's the first town on our route and a pretty good warm up. The can't-miss-it-stop is a guy selling antiques and junk in someone else's garage and driveway. Last year he told us it was his last year. We sincerely hope he lied to us. 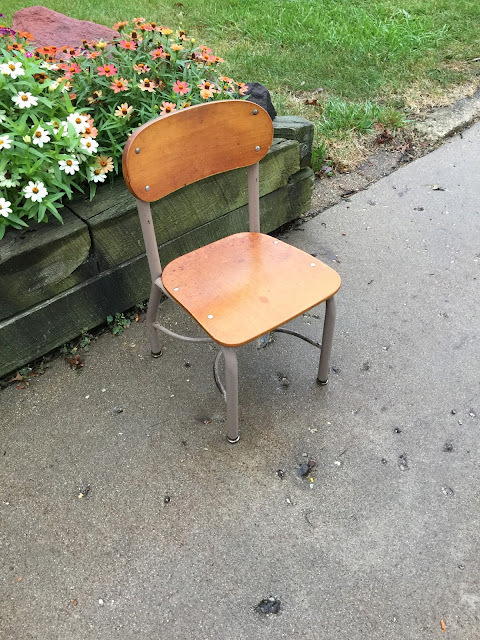 I bought two of these tiny little school chairs for Ben for $5 each from the Hannah City garage man. He had a bunch of them, I should've snagged them all. Flea market regrets, sigh. Off the Beaten Path: After Hannah City, we headed towards the next stop on our tour which is Farmington. Last year, we ventured away from the actual route a tad. We randomly followed signs for a 'BIG BIG SALE' to a sort of scary one lane gravel road into the woods. We were a tad nervous that we were being fooled into a kidnapping plot. Quick side story: a few years back, we followed the random signs that said things like 'BIG BIG SALE' and 'TURN HERE FOR DEALS' and we did, and it was a bust. A super bust. So why we decided to take another chance, I do not really know, but we were glad we did. We were not kidnapped. We had actually hit the jackpot of junk stops. We ended up at an old farm house in the woods with a few barns---completely filled with junk. I mean filled. The new owners had bought the property completely full and were trying to make it through the stuff. They were practically giving stuff away. I can't even tell you what we all bought but this is what our vehicle looked like when we left. 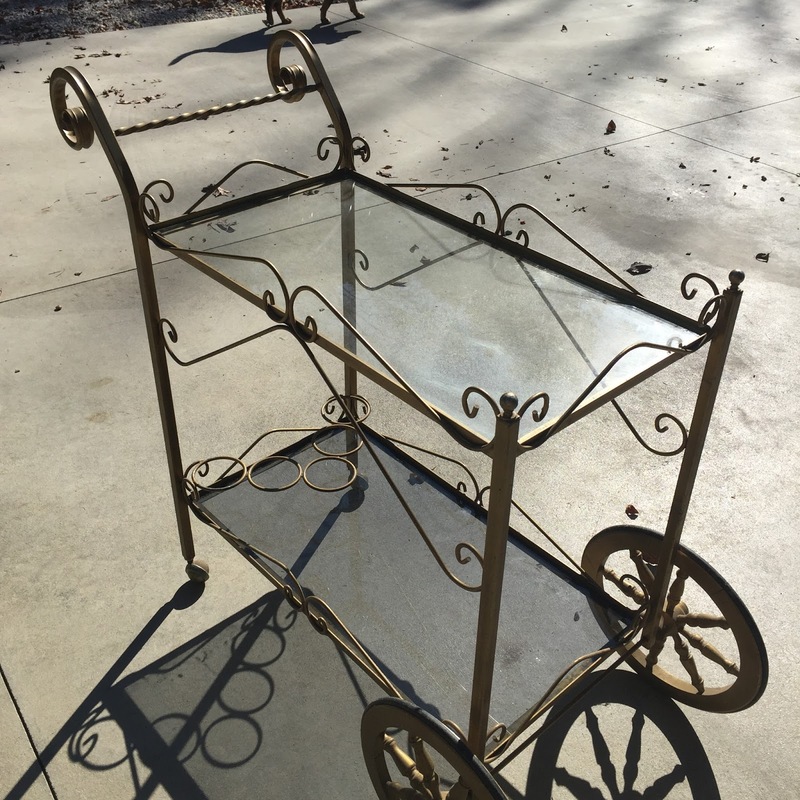 What I do know is that I got this bar cart for $10. It was a rough looking golden beauty. I cleaned it up and spray painted it ORB for my basement wine nook. So basically the moral of my story is, if you see a bunch of random signs on Spoon River Drive telling you about a BIG BIG SALE, it may be the jackpot of all junk spots--or it may be a trick. May the odds ever be in your favor. Farmington: I suggest you plan to spend some time in this town. First, take a pit stop at the Moose Lodge's pancake breakfast for a quick bite. The food is very good and quick. Get the biscuits and gravy and a cinnamon roll to go! Plus, clean bathrooms. The parking lot all around the Moose is full of good vendors. 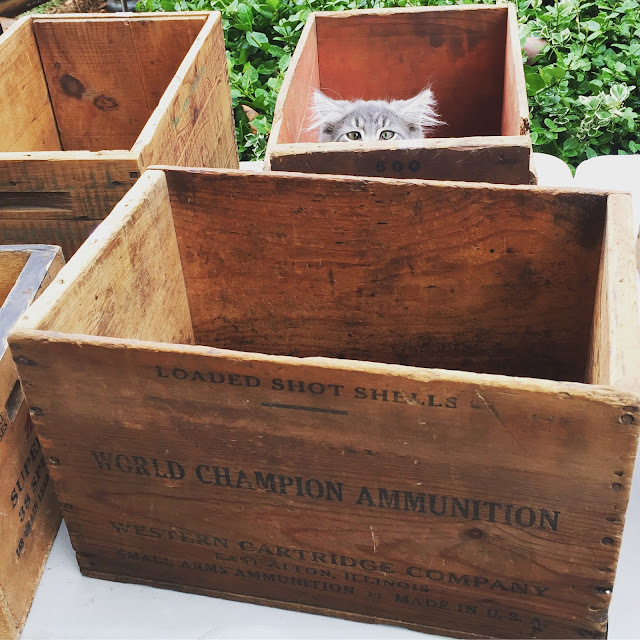 Junk, antiques, crafts. We typically find a few good booths here. There is pretty good sized craft show at the park in Farmington. We've skipped it the past few years. Mostly crafty stuff, less junk/antique stuff. But if crafts are your thing, go. Be sure to visit booth with the ladies who sell homemade breads and pastries, they have really delicious baked goods. Take home some raisin bread for the week. Next, and most important, head to the fairgrounds. You have one goal for the Farmington Fairgrounds. One goal. Get the apple fritters. I mean it. If you do anything in Farmington, stop at the fairgrounds flea market and wait in the line for the apple fritters. The line looks sort of long, and it is long. I promise after you take a bite of the warm apple fritters your only regret will be that you placed one order, and not two. There are vendors all along the way to the fairground in town. Stop and see what they have to offer too. Then after you get your fill of fritters, take a walk around the flea market at the fairgrounds. Several rows of fun booths, plus tents fills with cheap socks and kitchen strainers. Then turn around, and head towards Canton. Canton: Again, go for the junk vendors. Junk vendors are everywhere along the Spoon River Drive. Stop when something catches your eye. Buy all the junk. 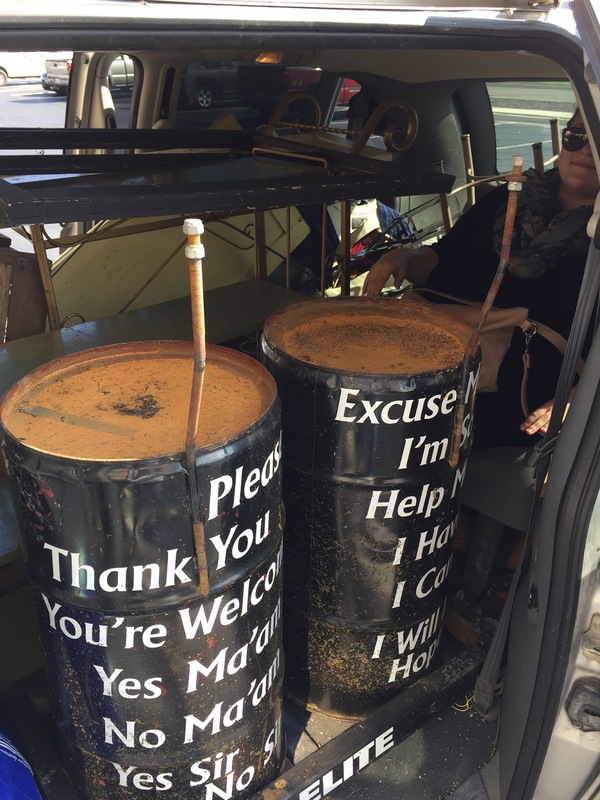 My mom bought these random drum things from one of our favorite vendors and I don't even know why...but my sister is lucky they didn't have more or she'd be calling herself an Uber. That's it folks. I will try to post a recap of our weekend and flea market finds before Spoon River 2018, but don't count on it. If you want to find your own Spoon River Treasures, see below for info. We're back. We're back for a quick update. 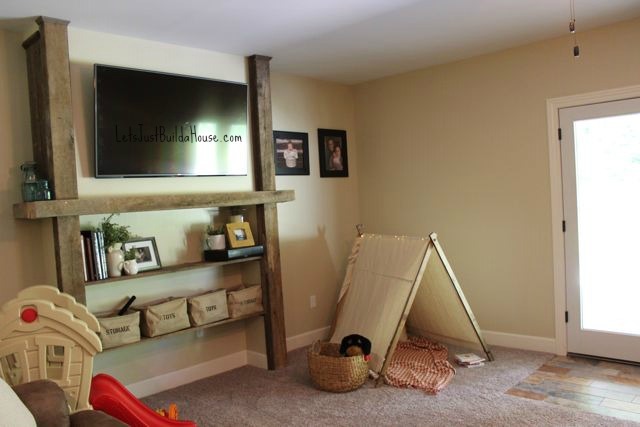 I know, I know, we were supposed to share the basement and home bar update months ago. But, not today. Someday. We've been working on a little DIY project lately and it really should be documented. Well, maybe I should say, we've asked my dad to do another DIY project for us. If we back up a little and look at photos from the build in 2012, we started with two pretty unsafe and very bland retaining walls. I mean, they did the job. They kept the dirt mud where it needed to be. They were fine. They were fine for a few years. Then we went and had a baby in 2015. Then that baby became a toddler and started walking, then running. Really, he runs all over. Also he climbs, climbs everything. So, the time came to make the retaining walls a bit safer. We needed custom railings out back asap. Luckily for us, my dad retired this year and has a bit of extra time on his hands. Bonus: he's a retired Ironworker. Steel railings sounded sturdy and safe. Adam, my dad and I discussed what we wanted the railings to look like. Mostly they talked about it and measured. I showed them a dozen Pinterest photos. But still, we discussed. Then they poured a concrete cap on the top of each retaining wall. They also installed steel plates where the welded posts would be secured. Then my dad got to work. Welding away the steel to create the railings. He welded two railings. One approximately 16 feet, the other 20 feet. After he finished, he set the railings, then welded the spindles. Adam was his trusty assistant. Last, they painted them black with black metal paint. Finito. Or so we thought. About that time we mentioned that someday we would like the retaining walls stoned. If you are new here, my dad did all the stonework on our house. The exterior has about 350 square feet of custom stonework. Our two-story fireplace is in the heart of our home. He did that too. We love it all, and it's a wonderful feature of our home. It's extra special because my dad did it himself. Next thing you know we are ordering the stone and my dad is back with his tools. I told you he's retired now. The stone is from the same quarry as what we used when we built. It's a cedar web-wall. We use a 2 inch cut natural stone. My dad picks and chooses his stones, and cuts many of them to create the web-wall. He uses his own mix of mortar. He's been doing this for most of the summer, but not every day. He'll come down and stay with us a few days here and there. A fishing trip and a Mexican vacation in between, and then he's back. He even had a helper some days! In matching overall bibs... all the heart eyes right here. Ben really loves helping his Pa when he's visiting. He's not too upset about the giant pile of sand in our backyard at the moment either. (The sand is needed to make the mortar mix). I have to say, our patio furniture looked even better when the wall was only 1/3 of the way done! And then just last week. It was done. It looks even better than we imagined. This was last week, and he's already been back to start the second wall. Soon we'll be having a patio party! We'll report back soon. Probably. From our family to yours, we hope you have a holly jolly Christmas! Although we don't get to share as much as we used to, we didn't forget about our readers. We have project updates coming up in the new year! You want to see how that basement finish went right? Do you send out Christmas or other holiday wishes to friends and family? I enjoy designing the card every year. I always create a few different designs then let Adam choose his favorite. 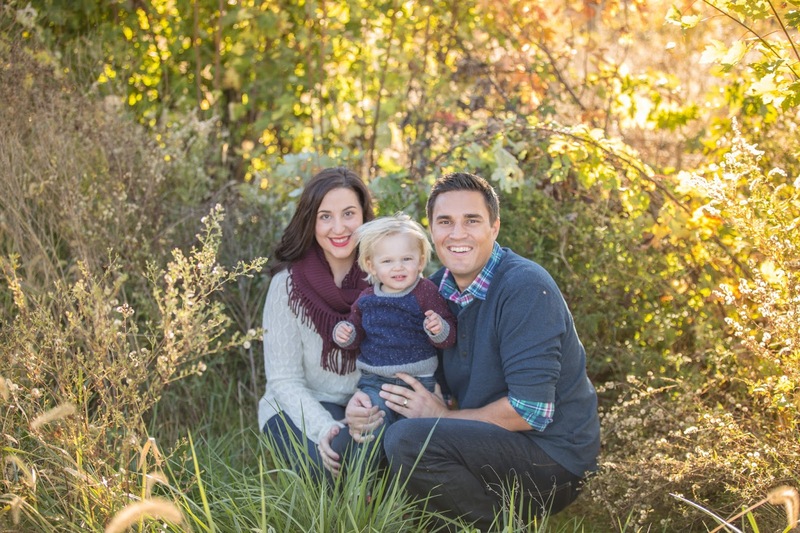 There are 100 places to make your holiday cards, but I always go back to Minted. I choose to use Minted because they feature art from all over the world for their beautiful designs. Minted is the marketplace for independent artists, from around the globe. Their designs are not only gorgeous and unique, but their products are the highest quality. This year, we took advantage of their free address book concierge. How beautiful are the fronts of our envelopes! This is a service Minted is offering at no charge for a limited time. Send your addresses in any format and Minted makes the hard part easy! You will thank yourself next year too, no searching for that address list! There is still time to order beautiful cards for the holidays. Christmas Cards, New Year's Cards, and even special Minted gifts from Minted Art & Minted Home can still be ordered in time for Christmas. Your cards will arrive by 12/20 if you use the free concierge service, you are still a step ahead and your friends and family will get their cards before Santa arrives! Minted is known for its high-quality paper and printing. Minted’s Signature paper is thick and luxurious with a creamy cotton texture, and has been optimized for photo printing. You can also choose 100% recycled paper, Pearlescent paper which adds a subtle shimmer, DoubleThick paper or even TripleThick paper. Minted also offers postcards, ornament cards and 8 unique die-cut shapes. A variety of backer options allow you to add additional photos, text, and customization options to your holiday card. I was compensated for my time for this post but as usual all opinions are my own. Exciting news! We've been featured in a local magazine. Our story, and photos of a few of our favorite projects and flea market finds, have been included in magazine Effingham Life. We did the photos and story earlier this year for their Spring publication but it didn't make the cut. We quickly put it in the back of our minds thinking it was buried. We were all surprised this week when friends and co-workers were calling and messaging us that we were cover models! Yep, we even made the cover! Many thanks to the great husband and wife team Tony Huffman & Danaille Huffman Photography for making us look good in photos and on paper! Summer is almost over. Which means blogging break is over. 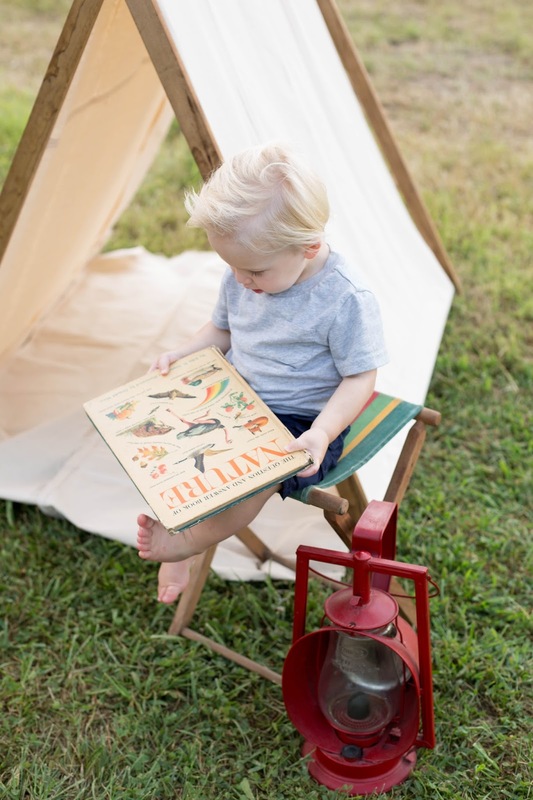 We typically take a blog break in the summertime to spend the longer days outside. I know what you are thinking... I promised the basement reveal months ago. It’s coming. Soon. But not today. 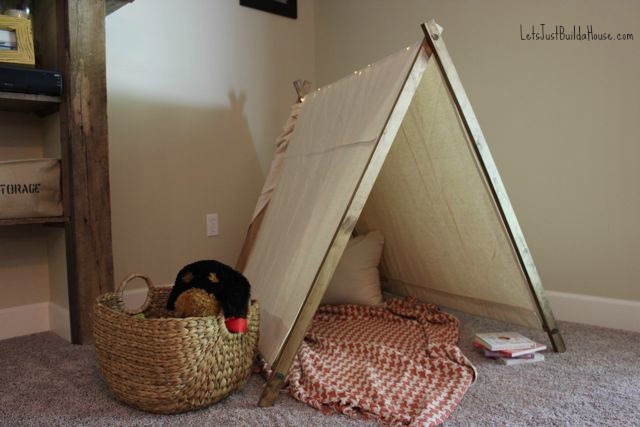 Today I’m sharing a simple DIY play tent that can be made during nap time. Really…. We did this during nap time. It was the easiest project we’ve ever done. 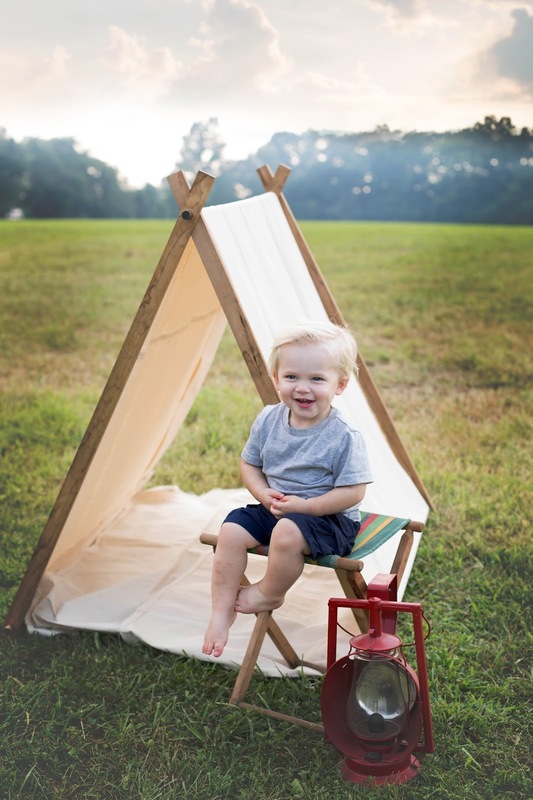 Those tepees are so popular right now and obviously it’s because they are gosh darn cute, aren’t they? I see them all over Instagram and blogs. They seem to be a staple in every nursery. 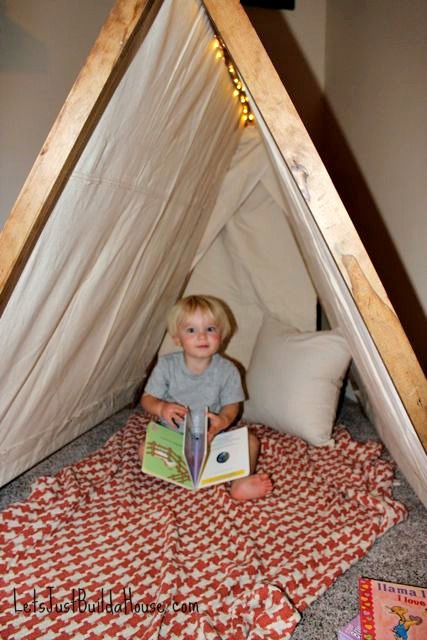 Check out this adorable gold and white striped tepee Hudson & Co. used in their gender neutral nursery! I so wanted one for Benjamin. He’s now at the perfect age to get a kick out of something like this. But I couldn't convince myself to spend the cash on one, even if they did make my heart pitter-patter. 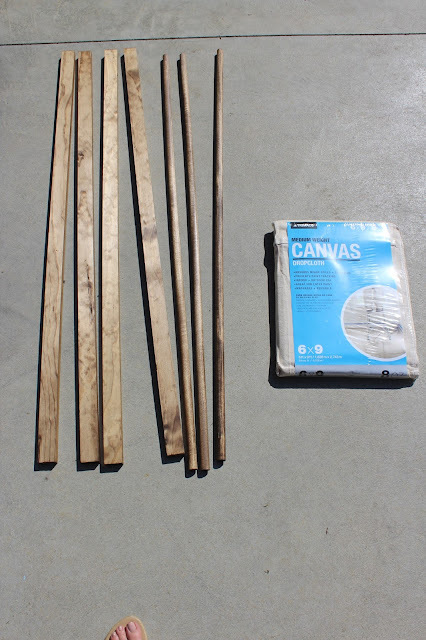 So, as we typically do, we looked into DIY-ing our own. 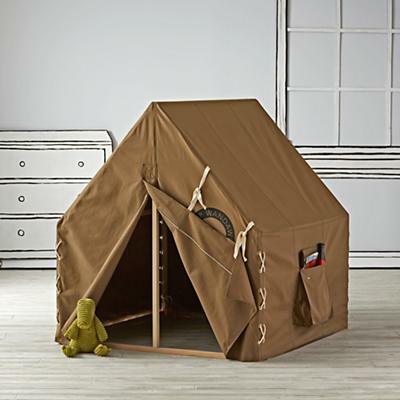 After doing a few minutes of brainstorming, instead of the tepee, we found inspiration from this cool explorer style tent from Land of Nod. So stinkin' cute huh? Look at the price tag too. Yipes. Well, this would have been perfect for Ben, but we didn't build that either. 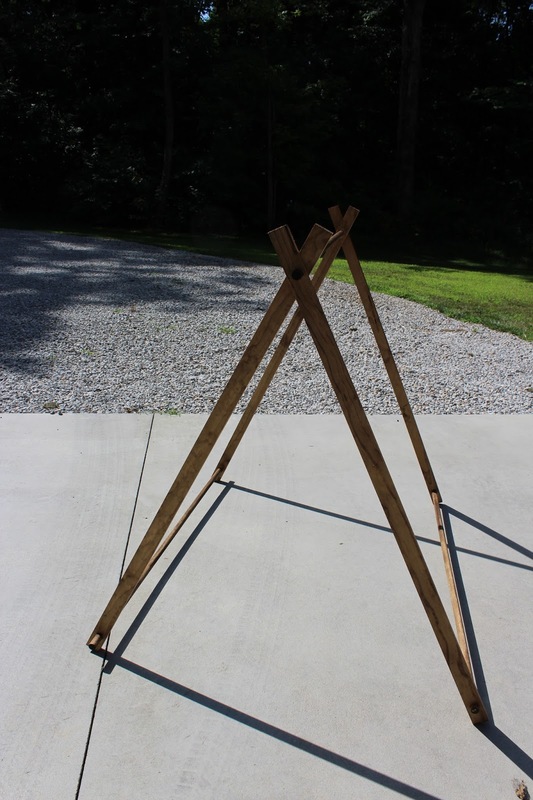 I think a tepee would've been easier than that! However, we took that as inspiration--which reminded me of the Boy Scouts, which made me think vintage Boy Scout stuff you see at flea markets...and sometime after that...we ended up with a super simple version--a traditional A-Frame style tent. 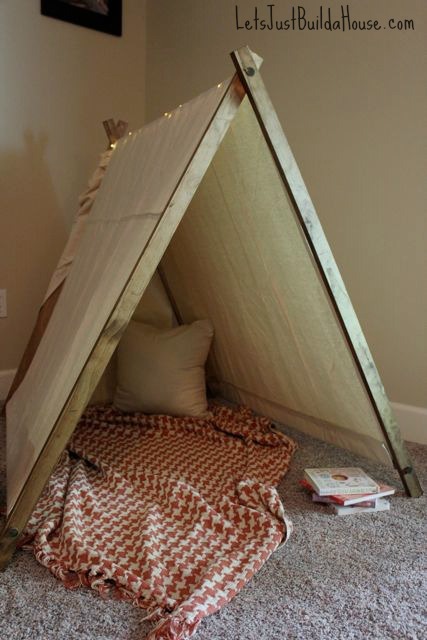 I did a bit of google-ing and found we were not the only ones building our own tents for our kiddos. As I said earlier, this was a quick project. Even better? It was inexpensive. Total cost for supplies was about $25. This project took less than an hour total. But, having a toddler it still took us two days. Adam stained the frame while Ben and I watered the flowers one evening. The next day, it took Adam about 10 minutes to measure, cut, and drill the holes. Just like that--and the frame was finished. During naptime, I cut the drop cloth a bit bigger than the frame, and stitch-witched loops for the dowels. It took me about a half an hour to cut and stitch-witch. It was such a fast project I'm pretty sure we both got to nap during nap time too. Seriously! I think the hardest part was putting it together with Ben and Scout chasing each other around and causing a commotion that evening. As far as the how-to...like I mentioned above we are not the only ones who have built our own kiddo tent. A quick pinterest search will give you a few dozen tutorials. We followed the HandMade Mood's tutorial. The only difference was we used 1x2s instead of slats. 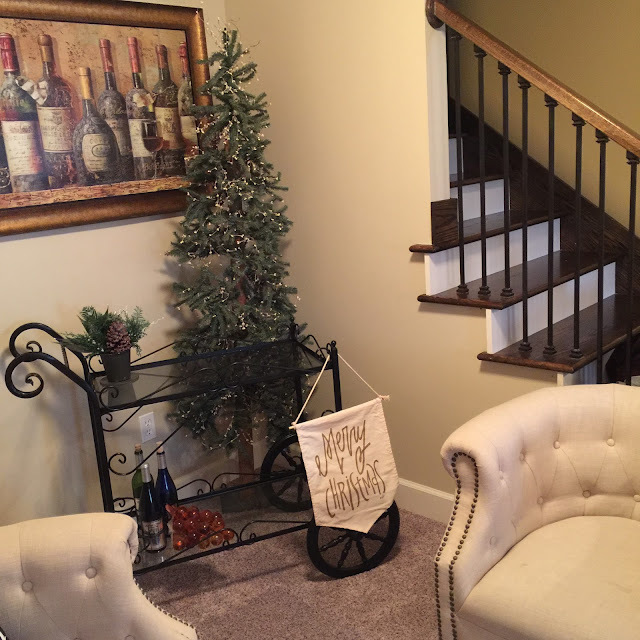 She also used a lighter fabric than a drop cloth. I imagine an old king sized sheet would be perfect too. Or if you had a coupon at Hobby Lobby or Joanne's you could use a few yards of printed fabric for some pizzazz. I like the simplicity and texture of the drop cloth. Maybe we'll stencil something on it later. For now, this is stationed in our basement for playtime. 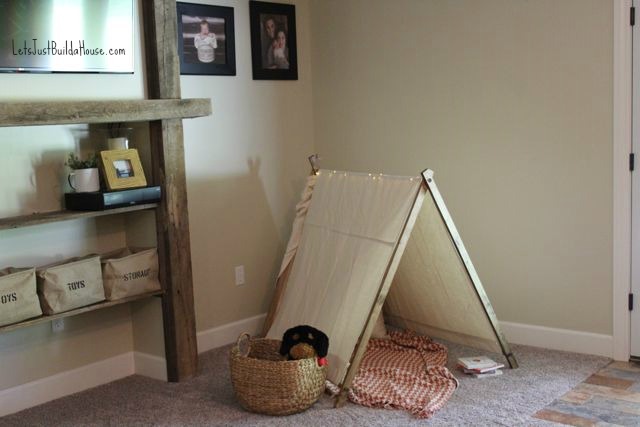 Later on when Ben gets a big boy room, we’ll move it there so he can have his own reading nook. 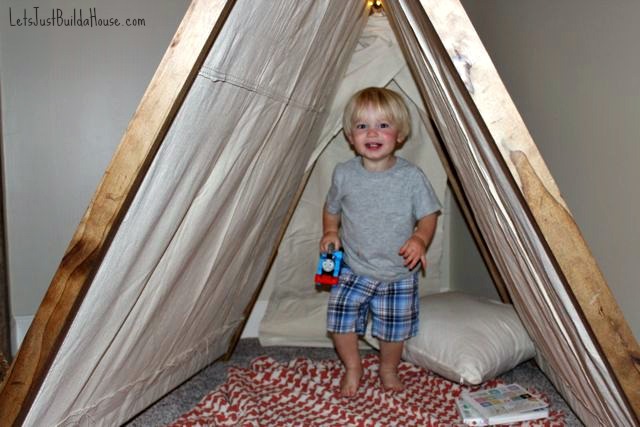 Bonus: the tent folds up in a snap for easy storage when we need the space in the basement family room. The twinkle lights were a super clearance find at Homegoods one year. I should have bought all they had. Ben likes to bring his toys into the tent to play. He liked it so much, we took it with us to his 18 month photo shoot. I added a few camping themed items I had from the house. It ended up being a fun prop, and the photos turned out perfect. ﻿Here is another shot of the basement. 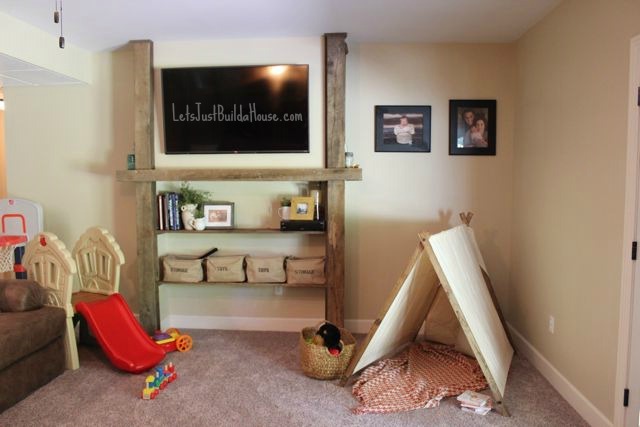 It's pretty easy to keep clean with all the bins for Ben's toys on the barn wood built-ins. I did make sure Adam's stinky socks were out of the frame when I took the photos. However, the plastic slide & basketball hoop are never not in the living room. Sidenote: I'm still figuring out this whole DSLR thing. The carpet is grey, taupe & brown...not purple! Our basement bathroom is finally finished. Well, mostly finished I should say. 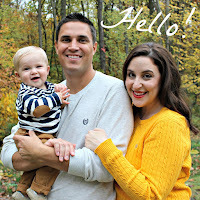 While we’re all waiting on the photographer (me) to take decent photos for blog sharing--sometimes it’s still fun to do a little design daydreaming! I teamed up with PlumbTile to create a fun mood board for a dreamy spa-like bath. If you’ve been around Let’s Just Build a House for a while, you know I love incorporating vintage and rustic pieces in every room of my home. The bathroom is no different! It’s easy to get carried away though with all the neat finds at flea markets and thrift stores. It’s all about balance. Let’s start with the floors. PlumbTile's glass tile & stone selection is top notch. It was fun browsing the beautiful glass tiles they offer. 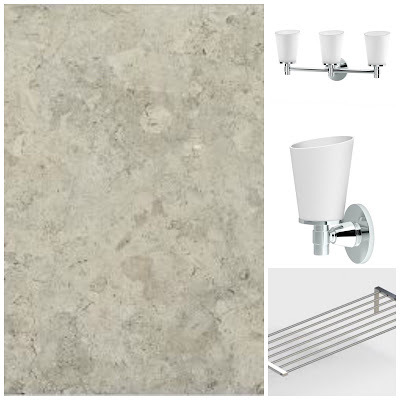 But for this mood board I had to stick with a natural stone like the limestone. I’m pretty happy with our natural stone in the master bathroom, so it’s an easy choice for this room design. I love the color too. Oh, and how about the accent tiles below? Wouldn't that be fun to incorporate into your bathroom? They reminded me of my recent vacation to Mexico! I had to pull them into the design for some fun and warmth. We typically stick with a neutral base tone of flooring and wall color, and then pair it with crisp white as accents. It helps to give a clean and spa-like tone. Towels, white linens, and of course the lighting is important! PlumbTile is really a one stop shop. They have what seems an endless selection of lighting . I’d choose this white and chrome 3 light fixtures over the mirror, with matching sconces throughout the room. My favorite tip is to put your bathroom lights on a dimmer. It’s easy to create perfect mood lighting for soaking in the tub. That brings me to the tub in this design. Dream tub. Seriously. A copper tub is truly the showstopper in this design. 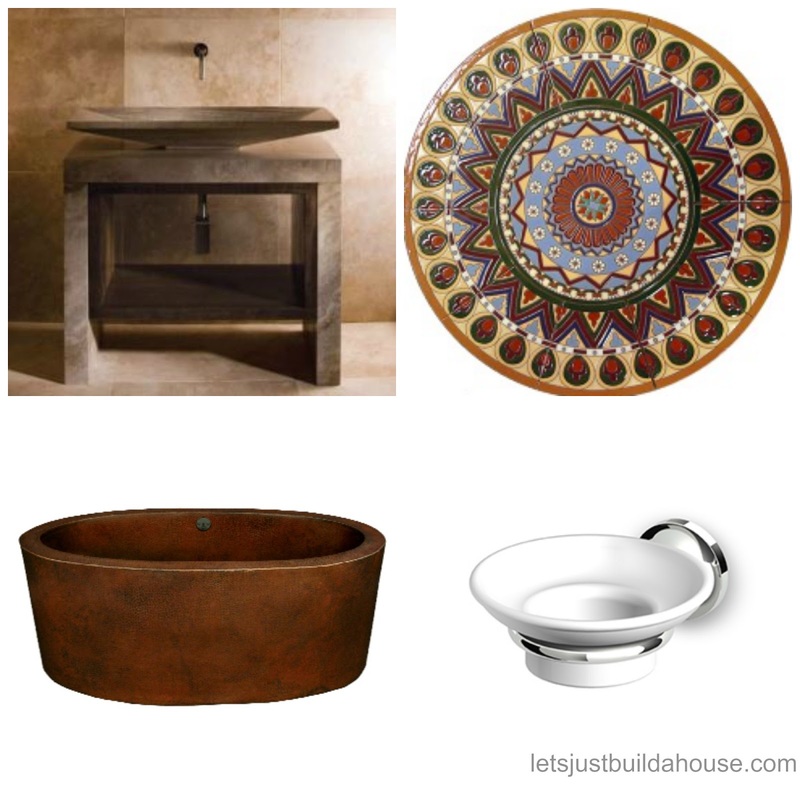 I’d certainly love this beautiful copper soaker tub paired with the marble vanity & sink combo. This brings a nice balance to our rustic items with modern and sleek. It’s always best to combine a few modern or contemporary touches into your decorating scheme to offset the rustic themes in the room. The gorgeous hand crafted vanity is a stand-out piece. It compliments the soaking tub and rounds out the bathroom design perfectly! Just picture yourself in this room, with a glass of wine, a good book, in that big copper tub! Do you have a bathroom renovations, refresh, or renovation in progress or on your mind? This post was written by me and sponsored by the PlumbTile.com. I was compensated for my time, all opinions are my own.